Imagine the scene: A group of kids gathered around the table waiting for the arrival of the birthday cake. The birthday boy or girl is anxiously anticipating your next move. You've been keeping the birthday cake a secret, because you cant resist the look of pure joy on your child's face. As the cake approaches the table you see their eyes growing wider and their smiles growing larger. Few things are as satisfying as the excitement of your kid blowing out the candles on their favorite character cake. 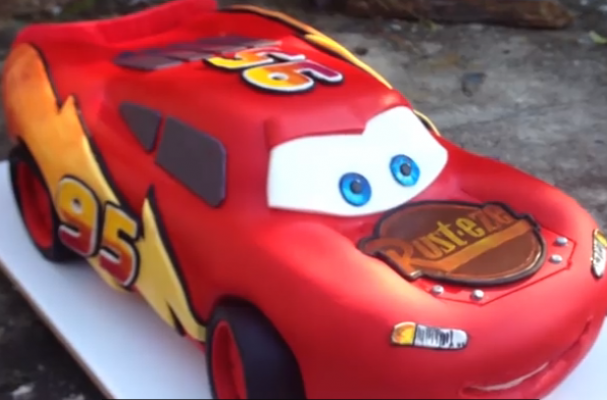 This 3D Lightning McQueen birthday cake can create that moment for you. Like with all decorated cakes they take time and patience and this one is no exception. This detailed cake decorating tutorial by How To Cook That provides step by step instructions as well as templates to ensure your success in this baking endeavor. While this tutorial is focused on creating a Lightning McQueen cake, it can easily be converted into other Cars characters with a few minor adjustments. Lightning McQueen is the star n the movie Cars just as this cake will be the highlight of your child's party.